Soft shortbread crust loaded with sweet mango filling and topped with crunchy oatmeal crumble. 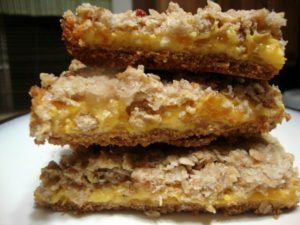 Here is an easy dessert recipe for Mango Oatmeal Bars. To make the crust, combine flour, sugar and butter using a pastry cutter. Press into 13 x 9 x 2-inch pan. Bake for 7 to 10 minutes or until lightly brown. Place mangoes, sugar, water and lemon juice in a saucepan and cook over low-medium heat until fruits are tender, about 10 to 12 minutes. Combine cornstarch and water in a separate bowl. Stir into mango mixture. Cook until mixture is thick. Cool slightly before pouring over prepared crust. Prepare the crumble topping by combining oats, flour, and sugar. Cut in butter. Sprinkle over mangoes. Bake for 50 minutes. Remove from oven and cool in pan. Cut into bars before serving.